Electronics get dirty like everything else, and now there’s a way to keep them clean. 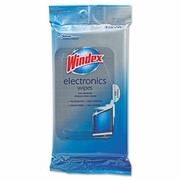 The Windex® you know and trust introduces a line of cleaners for your most valuable electronics. The gentle formula removes dust, dirt and grime from household electronics, leaving behind only our famous streak-free shine. GENTLE FORMULA REMOVES DUST, DIRT AND GRIME FROM ELECTRONICS. Pull wipe from pouch. 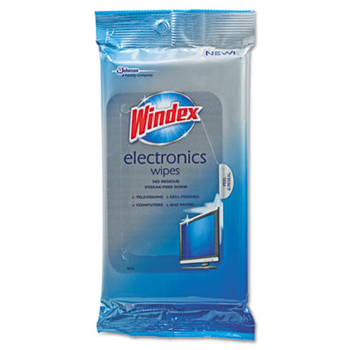 Wipe surfaces such as LCD screens, plasma screens, cell phones, touchscreens and keyboards. If using on electronic equipment, follow manufacturer instructions before using on an unknown surface, test on an inconspicuous area. 25 wipes per package. 12pkg/case sold by the case.